Trying to spot the green darner dragonfly, Anax junius--so named because of its resemblance to a darning needle--is like finding the proverbial needle in a haystack. But there it was, camouflaged in shrubbery on Sept. 23 in the Benicia Capitol State Historical Park. This dragonfly, one of the most common and abundant species in the United States, as well as North America, is one of the few dragonflies that migrate. It migrates from the northern United States south into Texas and Mexico, according to Wikipedia. "It also occurs in the Caribbean, Tahiti, and Asia from Japan to mainland China." 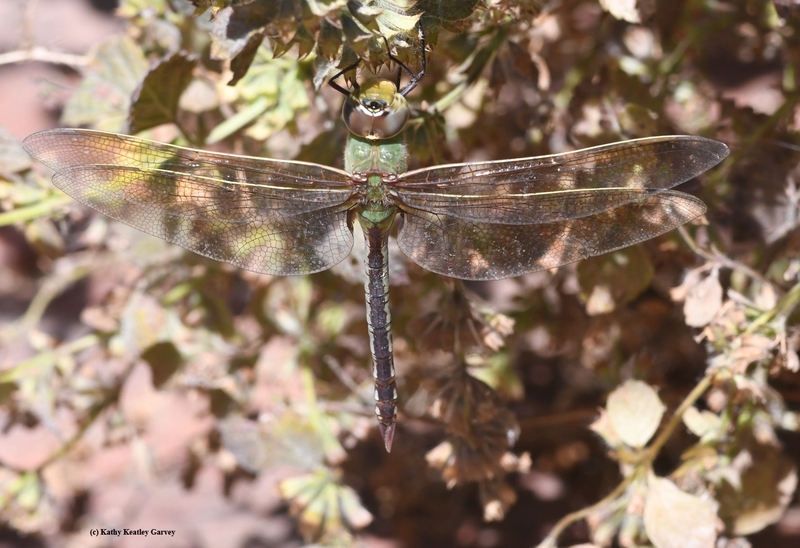 Did you know that the green darner is the official insect of the state of Washington, the Evergreen State? And it is one of the largest dragonflies in the order, Odonata? Males grow to 76 mm (3.0 in) in length with a wingspan of up to 80 mm (3.1 in)? Females oviposit in aquatic vegetation, laying their eggs beneath the water surface. The nymphs (naiads) are aquatic carnivores, feasting on insects, tadpoles and small fish. The adults--they catch insects on the wing. Their prey includes flies and mosquitoes. We remember several years ago when dragonfly/damselfly expert Rosser Garrison of the California Department of Food and Agriculture (CDFA) shared his knowledge of Odonata--and showcased some of his global specimens--at the Bohart Museum. Fossil records show that they were the world's largest flying insects--some with wingspans measuring three feet--and they existed before dinosaurs. "Dragonfly relatives existed before the onset of the dinosaurs---Triassic Period, 250 to 200 million years ago,” related Garrison, a senior insect biosystematist at CDFA. “They are considered beneficial since both larvae---all aquatic--and adults are predators." That green darner we saw in Benicia wasn't preying or sewing up people's ears (darners have been called "devil's darning needles") but it was darn camera shy.